Creating high quality glass office furniture is a something we have a real passion for here at Glasslab. We work hard to create stylish designs for our pieces of office furniture, and amongst our products are boardroom and meeting tables, sideboard and shelving units and even coffee tables. They all sound like simple products, but we ensure each individual piece is made with the highest standard of craftsmanship, and the result is a wide range of stunning glass furniture. One of our interesting ranges of furniture is our line of glass office desks. 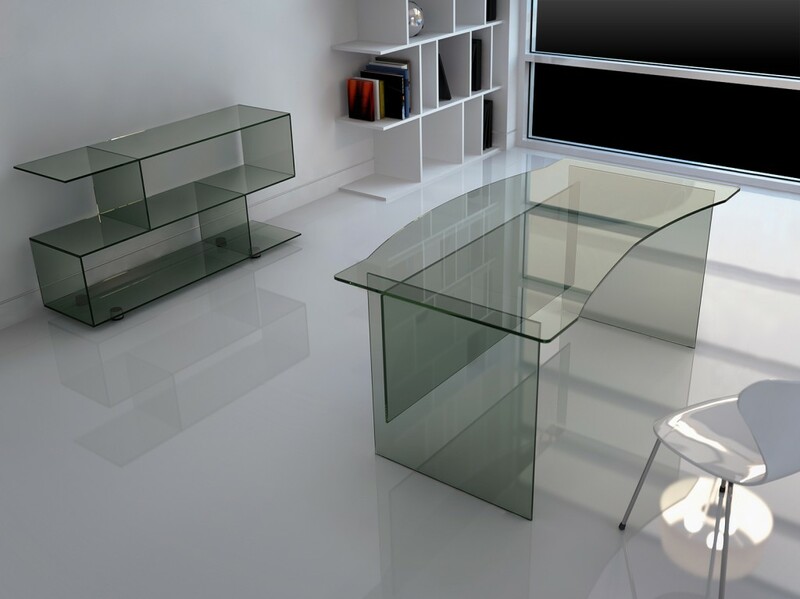 All of our desks are created with 12mm toughened glass and are both practical and durable. 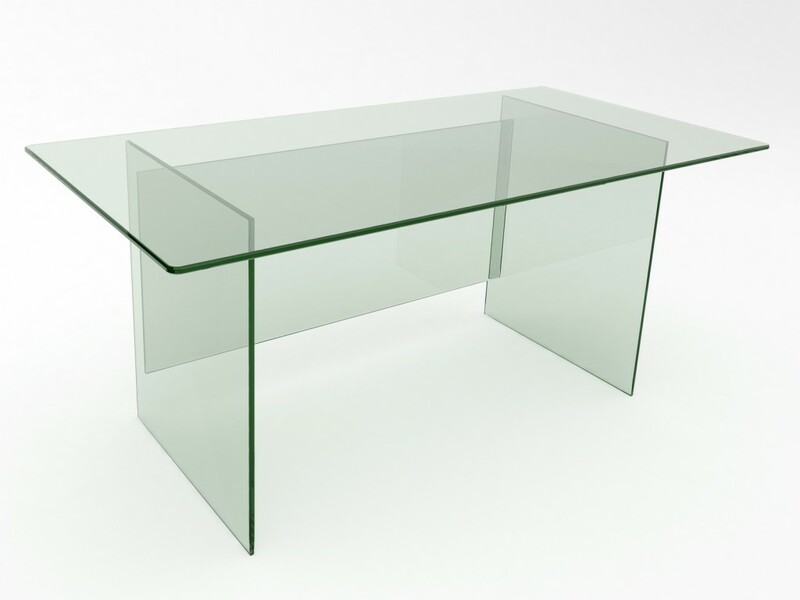 We have three standard designs for our glass desks, and the first of these is the Athos. The Athos desk has the most interesting style, coming with a round kidney shaped top. It’s 1400mm wide and 720mm high. The shape allows you to have an easy, well-organised workspace. The curve gives you a place to comfortably sit, while your screens and documents can be placed around you. Another desk with a good curve in it is the Divri desk. The Divri is 1600mm wide, and has an inward curve directly in the centre of the desk, rather than to the right as seen with the Athos. Although it still has the modern curved style, it’s a much simpler design. However, the simplest of designs is the Kalon desk. The Kalon desk has a straight rectangular look, with no curves or exciting design elements. However, it’s still not just a plain, boring desk. The fact it’s made completely from toughened glass to extremely high standards means it’s still a piece of office furniture to be desired. So those are the three Glasslab desk designs, but what if you want something a little different? Well, Glasslab offer a personalised bespoke design service, so your desk is exactly how you want it. Using our bespoke service, you can choose from the Athos, Divri or Kalon desk and make the changes you need. If you love the curved shape of our Athos desk, but it’s just too small for you or too big for your office space, we can make it to whatever measurements you require. Or, if you don’t like the glass bases of the desk, we can create the same design for you but using stainless steel legs instead. At Glasslab, we work with a variety of different glass types, so if you’re not happy with the glass being clear, we can create it with frosted glass alternatively. Other features of our desk bespoke design service include bevelled or bull-nosed edges, or the addition of modesty panels. Overall, our glass desks are exactly what you need to make your office look like it means business. Glass office furniture is exactly what is needed to make your workplace look like it’s right where it’s meant to be – the 21st century. Modern businesses are starting to really think through their interior design to give off the image they require, and just some simple pieces of glass furniture can go a long way. So why not look into adding a glass desk into your workplace? Why continue to work on boring, dated wooden designs? Click here to view our glass desk range, and order one to put your company straight into the modern world of office interior design. Make sure you look at the other stunning products we manufacture and design, and also read more about our special bespoke design service.